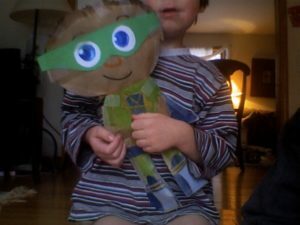 At our show in New York we were given some cool SuperWhy swag by the Breens. Their son is a creator of the terrific PBS kids show which teaches kids to read. William and Amelia were so thrilled. William took the CD up to his room and played Ukulele along to it dancing like he was listening to his rock’n’roll. 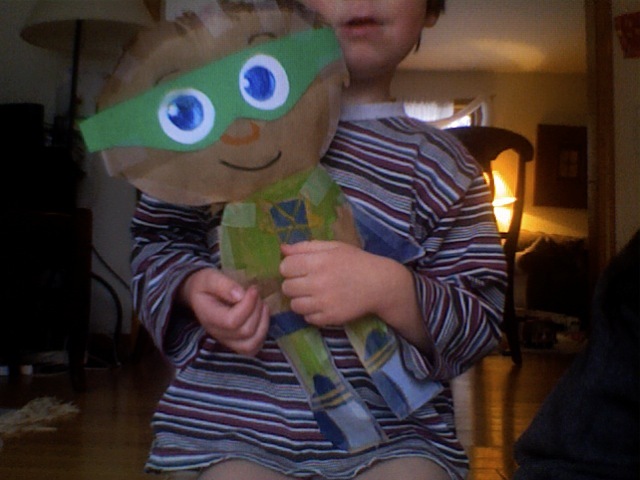 This morning, inspired by the SuperWhy stickers and Nerissa’s Almost Flat Lila™, we made Almost Flat Super Wyatt. Here he is. There are 4 characters in this show. Now William wants the rest of them… Lots of important work to do! Super cool! Sounds like a fun project. At 5:30am Sunday someone driving up Route 9 saw our church on fire and called the fire department. By the time the firefighters got there, the church was beyond saving….